Jarrod completed a degree in Exercise Science at the University of Tasmania’s Launceston campus. He has since worked at Coastal Physiotherapy, starting in 2010. He has been an accredited Exercise Physiologist with Exercise and Sports Science Australia, also since 2010. 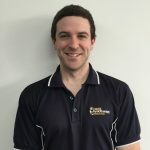 Jarrod is particularly interested in musculoskeletal rehabilitation and chronic disease/injury management as well as dealing with specific return to work rehabilitation programs. Jarrod runs a weekly class for those with Type 2 Diabetes and has experience in exercise prescription for weight management. He also enjoys providing advice for general strength and fitness training. Jarrod attained a certificate in Pilates (Equipment Level 1-3) from the Pilates Institute of Queensland in December 2013 and has since enjoyed prescribing suitable Pilates exercise for individuals as well as holding 4 group classes throughout the week. Jarrod enjoys keeping fit by participating in local sports and his training consists of running, cycling and swimming. His love for exercise and sport doesn’t stop there – you will find him supporting the Hawks during the AFL season and closely following most sports!